The ultimate challenge for the kiter and their support team: cross some 90 miles of the Caribbean’s deepest waters in as little time as possible. And all against some of the most talented kiteboarding competition around. The Estera Little Grand Race 2019 is a multi-class, team-based kiteboarding race from Little Cayman to Grand Cayman expected to take place on a single day between 20th and 24th February 2019. To be eligible for entry, each team must register online and meet the fee and fundraising requirement minimums as well as the necessary vessel and team support. Each team (including kiteboarder, captain and crew) must have satisfactorily COMPLETED at least one qualification test run and the pre-race test start organized by the race committee. The Race Committee will hold at least three qualification test runs in the weeks prior to the race as well as a test start in Little Cayman a day or two before race day. Details and dates of test runs will be posted on this website and sent to each registered team. All team members and the vessels being used in the race must have completed a test run together and specifically the captain and crew much have satisfactorily completed a test run on the vessel being used in the race. Each team member must sign the LGR2019 waiver. Little Grand Race 2019 is a grueling endurance race and participants must recognize the associated dangers and be comfortable that their collective kiteboarding and boating skills are up to the challenge. Every team member must attend the pre-race briefing for their team to be able to compete. Personal and Team details sheet of each team member must be completed, signed and returned to the LGR2019 Race Committee. Boat captains (skippers) and crew must attend a boat safety and kiter management workshop to be provided prior to Race Day by the Race Committee. 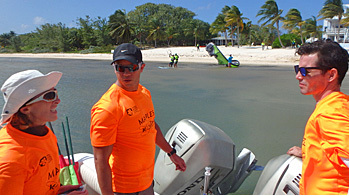 An Individual Kiteboarder supported by a boat, captain, at least two crew members and one land based support team member providing land based communication and tracking. Two or three kiteboarders all on the same class of board supported by a boat, captain and at least two crew members (a relay team kite boarder may double up as a crew member). A team must also consist of at least one land-based support team member providing communication and tracking. Twin Tip Board - symmetrical (about the short axis) bidirectional board with straps made to be ridden in both directions. Directional Board - symmetrical in the long axis, made to be ridden in with one end forward, with or without straps- surf boards and race board qualify as directionals. Foils - Any board with a hydrofoil type fin or keel attached which will cause the board to leave the surface of the water at various speeds. Kites, bars, lines and harnesses are not restricted in any way and class will only be determined by board type. Any Number or Type of Kite may be used by teams to complete the race. 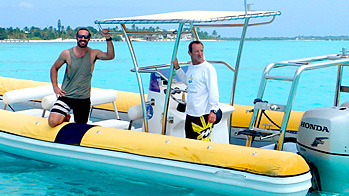 The race will be from a pre-determined Start Line in Little Cayman to the Finish Line in Grand Cayman. Both of these points will be confirmed to each team at the final Race Day pre-start briefing. The Race Day is anticipated that it will be held within the two week window of February 14th to February 25th 2019 but it is naturally weather dependent and may change date both in the longer term and short term. A likely three day window for a start date will be announced one to two weeks before and then reconfirmed three to five days before hand. The race will take place during daylight hours and, to be placed, teams must cross the finish line prior to 6:30pm Cayman time. The Race Committee will decide on the day whether the race is to proceed. Captains of each team will ten declare whether or not their team is able and willing to race. Each participating team member must then sign both the team waiver and personal team member waiver (to be provided by the Race Committee). Notice of the start time will be given a minimum of one hour before the race start and boat captains will be responsible for completing their vessel’s Port Authority departure protocols. Race start markers and finish lines will be reconfirmed at this time. Both kiteboarders (body not kite or lines) and team boat crossing the start line within five minutes of the start horn will be deemed as a team starting the race. Kiteboarders have right of way and all boats must avoid kiteboarders. False Start will require the team’s boat and kiteboarder to both circle the marker and re-cross the start line within the allotted time. During the final 60 seconds before the starting signal, a kiteboarder that stops, or significantly slows down and is no longer making material forward progress, shall keep clear of one that has not. Must have the kiteboarder cross the finish line under kite power and the team boat must cross the line as well for the team to finish the race. Kiteboarder, captain and crew much confirm that their team kiteboarder has completed the entire journey under kite power only. A relay team must have at least one of the team kiteboarders cross the finish line under kite power and the team boat must cross the line as well for the team to finish the race. If challenged, the kiteboarders, captain and crew must confirm that their team has never launched a kiteboarder ahead of any other team members already in the water. Safety of each kiteboarder is the sole the responsibility of themselves and their team - This is a gruelling endurance race and participants must recognize the dangers and be comfortable that their kiteboarding and boating skills are up to the challenge. All boat captains or their shore support must report their team’s position to Race Committee once per hour during the race. The moment of crossing of the start and the finish line is based on the position of the competitor and his hull. The position of control lines and kite are irrelevant. When sailing downwind, a kiteboarder that is looping their kite shall keep clear of one that is not. A kiteboarder on a starboard tack (right hand and shoulder forwards) has right of way. A kiteboarder on a port tack (left hand and shoulder forwards) must yield right of way (get out the way, pass downwind). For two kiters on the same tack, the kiteboarder upwind must give way to the kiteboarder downwind. All team members must wear the Race Committee issued shirt bearing a unique number or colour which is to be used for identification. be supported by least one offshore seaworthy support boat which will be at least 24’ LOA, equipped with a minimum of two engines and capable of a range of at least 150 miles. ensure their boat is registered and compliant with CI Port Authority requirements. Account Name: Kite for Cancer Ltd.
By Cheque - made payable to Kite for Cancer Ltd.
Cash - give it to a Kite for Cancer committee member when you next see one! If supporting a particular race participant or team, please include their name on the wire transfer or deposit form.Please email a copy of your deposit slips and cheques to schcora@gmail.com to help us keep track of our sponsorship funds. All proceeds go directly to the Cayman Islands Cancer Society to help with their extraordinary and tireless work within the Cayman community. 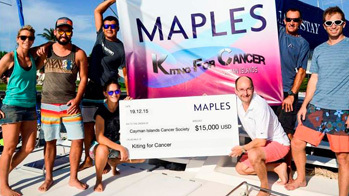 Sponsors commit, in good faith, financial or other support to the Estera Little Grand Race 2019 on the basis that all proceeds go to the Cayman Islands Cancer Society and that the Organisers will make every effort to conduct the Race as close as possible to the projected dates. Sponsors must accept that, due to circumstances beyond the event Organiser's control, kiteboard competitors, their teams or other volunteers may not be able to take part and conditions may cause the Race to be abandoned or cancelled entirely and that In such circumstances, no refund is due to Sponsors.